The Nemesis Conjecture: Is an Unseen Binary Companion of the Sun Sending Comets Towards Earth? Some scientists believe that something could be hidden beyond the edge of our solar system a distance of about 50,000 to 100,000 AU (about 1-2 light years), somewhat beyond the Oort cloud. 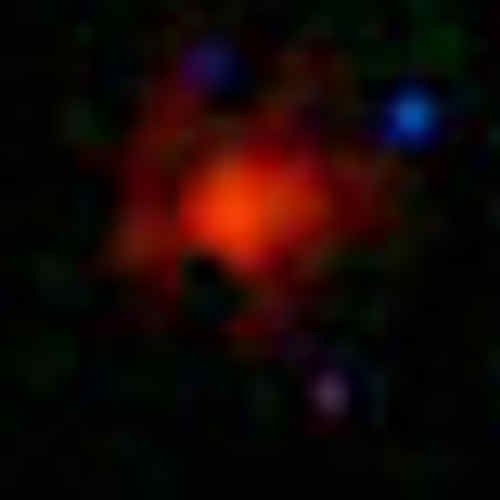 Named “Nemesis” or “The Death Star,” this undetected object could be a red or brown dwarf star, or an even darker presence several times the mass of Jupiter. If our Sun were part of a binary system in which two gravitationally-bound stars orbit a common center of mass, their interaction could disturb the Oort Cloud on a periodic basis, sending comets whizzing towards us. Binary star systems are common in the Milky Way. It is estimated that one-third of the stars in the galaxy are either binary or part of a multiple-star system. Originally, Nemesis was suggested as a way to explain a cycle of mass extinctions on Earth. Astronomers think that brown dwarfs may be as numerous as stars like our Sun, but brown dwarfs are often too cool (dark) to find using visible light. Using infrared light, the WISE mission could find many brown dwarfs within 25 light years of the Sun. These cool stellar objects are nearly impossible to see in visible light, but stand out when viewed in infrared. Their diameters are about the same as Jupiter's, but they can have up to 80 times more mass and are thought to have planetary systems of their own. The paleontologists David Raup and Jack Sepkoski claim that, over the last 250 million years, life on Earth has faced extinction in a 26-million-year cycle. Astronomers proposed comet impacts as a possible cause for these catastrophes. Our solar system is surrounded by a vast collection of icy bodies called the Oort Cloud. But there is no evidence that comets have periodically caused mass extinctions on Earth. The theory of periodic extinctions itself is still debated, with many insisting that more proof is needed. Even if the scientific consensus is that extinction events don’t occur in a predictable cycle, there are now other reasons to suspect a dark companion to the Sun. A new object, Sedna, a dwarf planet, has a 12,000-year orbit around the Sun. It’s a mystery why Sedna has such an elongated orbit.The Oort Cloud is thought to extend about 1 light year from the Sun. is one of the most distant objects yet observed, with an orbit ranging between 76 and 975 AU (where 1 AU is the distance between the Earth and the Sun). Sedna’s discoverer, Mike Brown of Caltech, noted in a Discover magazine article that Sedna’s location doesn’t make sense. "Sedna shouldn't be there,” said Brown. “There's no way to put Sedna where it is. It never comes close enough to be affected by the Sun, but it never goes far enough away from the Sun to be affected by other stars.” Leading Brown and others to theorize that a massive unseen object may be responsible for Sedna’s mystifying orbit, its gravitational influence keeping Sedna fixed in that far-distant portion of space. John Matese, Emeritus Professor of Physics at the University of Louisiana at Lafayette, suspects Nemesis exists because comets in the inner solar system seem to mostly come from the same region of the Oort Cloud. Leading Matese to conclude that the gravitational influence of a solar companion is disrupting that part of the cloud, scattering comets in its wake. His calculations suggest Nemesis is between 3 to 5 times the mass of Jupiter, rather than the 13 Jupiter masses or greater that some scientists think is a necessary quality of a brown dwarf. Even at this smaller mass, however, many astronomers would still classify it as a low mass star rather than a planet, since the circumstances of birth for stars and planets differ. Matese estimates Nemesis is 25,000 AU away (or about one-third of a light year). The next-closest known star to the Sun is Proxima Centauri, located 4.2 light years away. Richard Muller of the University of California Berkeley first suggested the Nemesis theory, believes Nemesis is a red dwarf star 1.5 light years away. Many scientists counter that such a wide orbit is inherently unstable and could not have lasted long – certainly not long enough to have caused the extinctions seen in Earth’s fossil record. But Muller says this instability has resulted in an orbit that has changed greatly over billions of years, and in the next billion years Nemesis will be thrown free of the solar system. WISE began scanning the sky on January 14, and NASA recently released the mission’s first images. The mission will map the entire sky until October, when the spacecraft’s coolant runs out. Part of the WISE mission is to search for brown dwarfs, and NASA expects it could find one thousand of the dim stellar objects within 25 light years of our solar system. Davy Kirkpatrick at NASA’s Infrared Processing and Analysis Center at Caltech found nothing when he searched for Nemesis using data from the Two Micron All Sky Survey (2MASS). Now Kirkpatrick is part of the WISE science team, ready to search again for any signs of a companion to our Sun. He believes Matese’s description of Nemesis as a low mass object closer to home is plausible. Comet “Siding Spring” appears to streak across the sky like a superhero in this new infrared image from NASA's Wide-field Infrared Survey Explorer, or WISE. WISE will be looking for comets and asteroids that might pose a threat to Earth.